Build and maintain a healthy Sunday School ministry at your church. Get Acquainted Day - February 27, 2018 10 a.m. - 2:30 p.m.
Kentucky Baptist Building, Louisville, KY. If you are a new pastor or church planter, or if you would like to know more about the KBC, please join us for Get Acquainted Day on February 27. 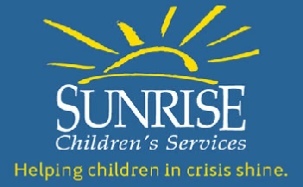 Get Acquainted Day is free to attend, but registration is required. 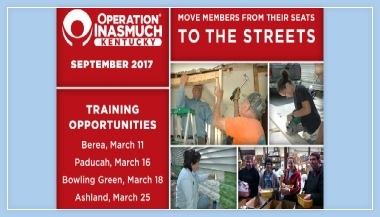 Operation Inasmuch Kentucky is a day of hands-on service to the community during the month of September. Imagine what an impact it will make when Kentucky Baptist church members move from their seats to the streets, conducting ministry projects for the least of these. Fellowship among church members will be strengthened, and the love of Christ made known when believers of all ages help people at their points of need. 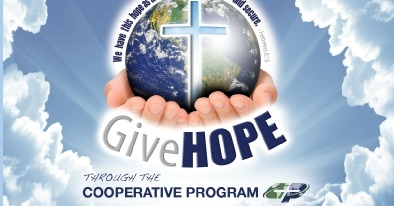 Operation Inasmuch projects are encouraged during the month September in partnership with Kentucky WMU's Eliza Broadus state missions emphasis. Too many people that say "our father" on Sundays spend the rest of the week acting like orphans! For more information about getting your church involved in Tell Your Story, go to tellyourstory.today click above link.. The video about Crosswoods Baptist Church and their discipleship experience with Tell Your Story is available for download at the link below. 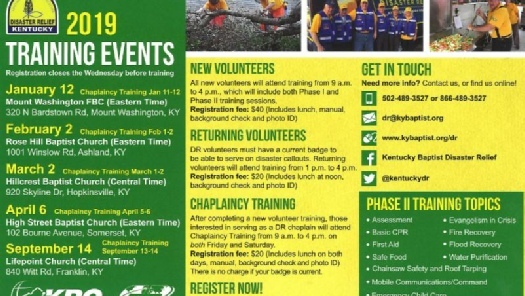 When disaster strikes, some of the first to respond with help are Kentucky Baptist Disaster Relief volunteers. Did you know that half of NAMB’s funding each year comes from the Annie Armstrong Easter Offering? 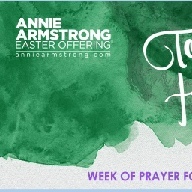 Half of the North American Mission Board’s funding comes from the Annie Armstrong Easter Offering (AAEO)—with 100 percent of your giving going directly to support more than 5,000 missionaries across the U.S. and Canada. AAEO gifts are well-stewarded through an accountability process so you can be confident your gift is making a maximum kingdom impact.